Are you supplying the item? What would you like airbrushed? Monica Fuentes (Houston Press) - I ordered a custom airbrushed t-shirt and couldn't be happier with the outcome. DeAngelo was patient and diligent in making sure I got exactly what I wanted, a spring break style t-shirt with custom lettering. 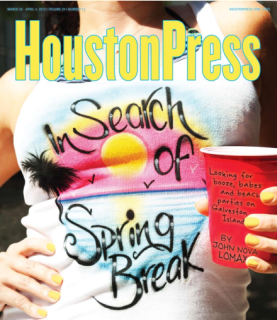 We photographed the shirt for the cover of the Houston Press and it turned out great! They turned the project around in plenty of time for the photo shoot. I would highly recommend the team and plan on calling on them in the future! Get the latest updates on upcoming sales and new products!